"There’s a sucker born every minute,” the phrase attributed to showman P.T. Barnum* is often used when developing a marketing campaign. There is a pervasive thought that you can tell your target market anything and they will buy it. 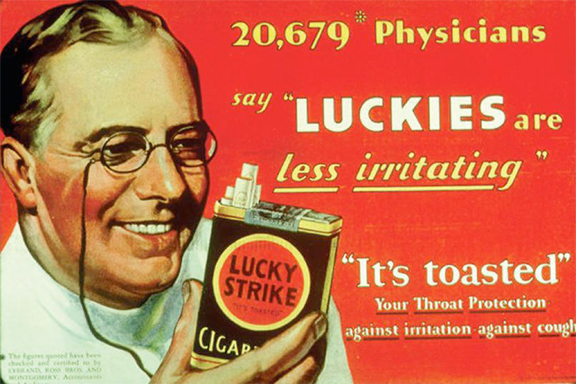 For instance, if you are a tobacco company, you can tell your customers that doctors find it fine to smoke cigarettes, as the ad at the top of the page suggests. For decades, cigarette manufacturers got away with this kind of advertising, but they faced their day of reckoning and no one is buying it anymore. So what about now? Are we so sophisticated that we are immune from such audacious claims in marketing? Maybe, but maybe not. For the most part, people believe what you say about your brand, that is, until someone calls you on it and the word gets out. Smart marketers need to know how to handle two different situations: how to effectively push to the edge in marketing and how to keep from stepping over the line of false claims. Marketing works very well when we are making fantastic claims about our brand. Sensationalism grabs the attention of people and, after all, that is the task of marketing, isn’t it? Yet if you cannot back up your claims, the sensationalism will come back to burn you. I would advise you to find the marketable edge you have over your competition. What do you do better than they do? Market it. Yet be prepared to back up your claims. Show your customer that you are not just making sensational headlines, but actually doing what you say. One thing all of these companies have done is extensive side-by-side research with their competition. They have picked a direction in marketing that keeps the eye of their customer, but they are backing up those claims and continuing to develop their products and services to keep that edge. In other words, they have to continue to work at backing up their marketing slogan and that involves more than the marketing department. It involves everyone in your company. We live in a day when one misstep is broadcast across social media at the speed of light and just like that, there goes your credibility along with your market share. What took decades for people to disbelieve in the tobacco company ads takes no time at all these days. That has caused some in marketing to stay away from promoting their edge. They play it safe. It leads to very bland marketing campaigns. If you are in charge of your marketing, do yourself a favor and take a look at what you do best. Now look at what your competition is doing. Can they do what you do better than you? If so, find something else to promote about your brand. But if they cannot keep up, you have found your edge. Next, find out what your customers think about your edge. Does it matter to them? Is it a difference maker? As a marketer, you may have to educate your customers. Tell them why your edge is so much better for them. Next, give it a name: brand your edge. Make it part of the conversation your sales reps are having with customers. Pushing the edginess in marketing still works as long as you can back it up. To make marketing work effectively, you have to have everyone who touches the customer saying the same thing. *Although this phrase has been popularly attributed to P.T. Barnum, it appears that there was never an account of him saying this. Some have attributed it to several persons speaking about Barnum, but nothing has ever been firmly established about the origins of the phrase.